Britain’s Andy Murray has delayed his comeback from surgery but still hopes to play at Wimbledon in July. The 31-year-old Scot, who has not played since Wimbledon last year, had a hip operation in January. He had hoped to play in the grass-court Libema Open in the ‘s-Hertogenbosch, the Netherlands, starting on 11 June. “I am not quite ready to return. I am still aiming to play in the coming weeks, but I want to be 100% when I do return,” said Murray. Murray, the British number two, has won Wimbledon twice – in 2013 and 2016 – and this year’s tournament starts on 2 July. The Fever-Tree Championships at Queen’s in London takes place from 18 to 24 June, and there are grass-court tournaments in the Turkish city of Antalya and Eastbourne in the week before Wimbledon. “I’ve been out close to a year now, which is a lot longer than me or any of my team expected, but I’m getting closer to playing again,” added Murray. Earlier this week, his mother Judy told BBC Sport that Andy would not risk playing at Wimbledon unless he was fully fit. After withdrawing on the weekend before last year’s US Open, and then heading to Australia in January in a second attempt to make his comeback, Murray has promised not to return this time until he is 100% fit. And so time is against him – as far as the grass-court season is concerned. Murray returned to the practice court in late March, following his surgery of 8 January, but was only able to play for about three weeks until his hip problem flared up again. It is encouraging to hear he is now back on court, but after five weeks on the sidelines – and with the Queen’s Club tournament starting in less than a fortnight – it is hard to see how he can be truly competitive on the grass this year. Of greater long-term importance, however, is how the hip responds when Murray starts to up the intensity of his on-court sessions, and begins to play practice sets against other ATP players. If you were Italy’s Marco Cecchinato, who beat Novak Djokovic to reach the Roland Garros semi-finals on Tuesday, wouldn’t you also be believing anything is possible? Defeat Dominic Thiem, a three-time Roland Garros semi-finalist, on Friday? “Why no?” Cecchinato said. Who cares that the last time Cecchinato beat Thiem was five years ago, during a Futures final, and on hard courts, a much different setting than where they’ll play their on Friday, on Court Philippe-Chatrier, at Roland Garros, during a Grand Slam semi-final. But at least Cecchinato has some past experience to rely on against Thiem, who swept Alexander Zverev 6-4, 6-2, 6-1 earlier Tuesday to reach his third Grand Slam semi-final. Before Roland Garros, Cecchinato had never won a Grand Slam match, losing at the 2015 US Open (l. Mardy Fish), 2016 Australian Open (l. Nicolas Mahut), 2016 Roland Garros (l. Nick Kyrgios), and 2017 Wimbledon (l. Nishikori). The Italian fell in the final round of Roland Garros qualifying last year. And after his first two sets in Paris this year, Cecchinato couldn’t have been thinking, ‘Here I come semi-finals.’ He lost the first two sets against Romania’s Marius Copil before coming back to win 10-8 in the fifth. It was Cecchinato’s first five-set match. But round by round, the first Italian Grand Slam semi-finalist since Corrado Barazzutti at the 1978 Roland Garros has believed a little bit more. Cecchinato celebrated his biggest win on Tuesday, beating former No. 1 Djokovic 6-3, 7-6(4), 1-6, 7-6(11). Pablo Carreno Busta was the first of two Top 10 opponents (David Goffin) Cecchinato knocked out at Roland Garros, which doesn’t include his win against Djokovic, No. 22 in the ATP Rankings. If the 25-year-old Italian can transform belief into action again on Friday and beat the seventh-seeded Thiem, Cecchinato will have beaten three Top 10 opponents and find himself in a Grand Slam championship. “Amazing tennis today. I was two sets up against Novak. In the third, I was a little bit tired. Also, in the fourth, I was… down, and I start to play very well. And on the tie-break, I played very, very well in the tie-break,” Cecchinato said. Three-time Wimbledon champion Novak Djokovic says he “doesn’t know if I am going to play on grass” after losing in the French Open quarter-finals. Djokovic was beaten 6-3 7-6 (7-4) 1-6 7-6 (13-11) by Italy’s world number 72 Marco Cecchinato in Paris on Tuesday. An elbow injury has limited the 12-time Grand Slam champion’s playing time this year, while he was treated on his neck during the defeat by Cecchinato. The 31-year-old Serb said he did not “want to talk about tennis right now”. It could mean Djokovic misses Wimbledon, which starts on 2 July. How many multiple French Open winners can you name? Djokovic’s defeat by Cecchinato, who had never won a Grand Slam match until Roland Garros, means he has not reached a semi-final of a major since the 2016 US Open. He has dropped to 22nd in the rankings – his lowest since October 2006 – after a year which has been disrupted by injury. The former world number one decided to take time off after retiring from his Wimbledon quarter-final against Tomas Berdych last summer with an elbow injury. He did not play again until January, when he reached the last 16 of the Australian Open, but then needed a “minor procedure” on the same elbow after losing to Hyeon Chung, ruling him out for two months. After returning at Indian Wells in March, Djokovic made slow progress in terms of results before warming up for Roland Garros with a run to the Rome quarter-finals. He has spoken this week about building up his form in order to peak at the Grand Slams and appeared to be doing precisely that when he demolished 30th seed Fernando Verdasco in straight sets in the fourth round. But Djokovic was shocked to fall at the last-eight stage in Paris. “Any defeat is difficult in the Grand Slams, especially the one that came from months of build-up,” he said during a spiky news conference which, unusually, took place only about 15 minutes after his defeat. Asked if he was back, Djokovic was blunt. “I am back in the locker room. That’s where I’m back,” he said. Djokovic, whose 20th seeding was his lowest at a Slam since the 2006 US Open, has lost in the quarter-finals at Roland Garros for the second successive year. These defeats have followed his victory in 2016 which sealed a career Grand Slam – only the eighth man to have achieved the feat – and meant he held all four majors at the same time. Djokovic left Court Suzanne Lenglen and headed straight for the news conference room: not the main one, which has become his natural home, but the secondary one, which was lacking an official microphone and did not have nearly enough room for those wishing to attend. His comments about the grass season were made in the heat of the moment, but this defeat will really sting. It is a reminder that for all his progress in recent weeks, he is still a shadow of the man who had won six of the previous eight Grand Slams when he won the title here in 2016. And, physically, Djokovic still has concerns. The elbow he had minor surgery on after the Australian Open seems much improved, but he once again needed treatment on the shoulder that has caused him intermittent trouble over the past couple of years. Britain’s Dan Evans progressed to the second round of the Surbiton Trophy, but British number two Heather Watson suffered a surprise defeat. Top seed Watson was knocked out of the grass-court tournament by fellow Briton Gabriella Taylor, ranked 104 places below her, losing 3-6 6-4 6-3. Former top-50 player Evans continued his return from a drugs ban by beating Italy’s Thomas Fabbiano 6-4 7-5. British number four Liam Broady lost to French top seed Jeremy Chardy. Broady went down 7-6 (10-8) 6-3, before James Ward was defeated 4-6 6-3 6-3 by Ukraine’s Sergiy Stakhovsky. There were victories in the women’s event for Britons Katie Boulter, Katy Dunne, Katie Swan and Harriet Dart. Rafael Nadal will aim to move one step closer to a historic 11th Roland Garros title when he clashes with Diego Schwartzman in the quarter-finals at Roland Garros on Wednesday. 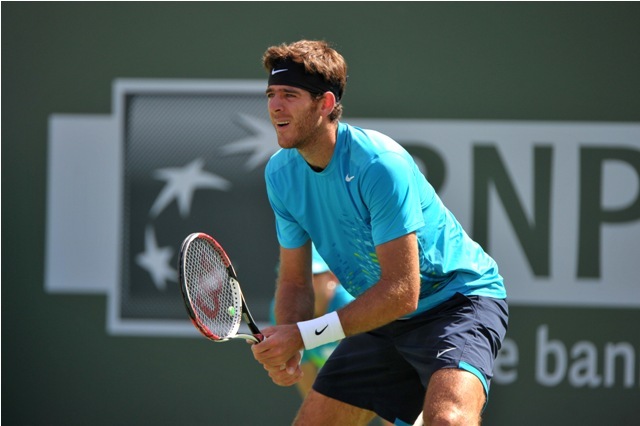 Meanwhile, on Court Suzanne Lenglen, Marin Cilic and Juan Martin del Potro face off, for the 13th time in their FexEx ATP Head2Head series. ATPWorldTour.com previews Wednesday’s Roland Garros quarter-finals. Nadal and Schwartzman will do battle for the second straight Grand Slam on Wednesday. At the Australian Open, earlier this year, Nadal overcame the 5’7″ Argentine after three hours and 51 minutes to reach the quarter-finals. The two also met this year at the Mutua Madrid Open, with the Spaniard prevailing in straight sets to score his second clay-court victory over Schwartzman. Schwartzman will take heart from his heroics this fortnight in Paris. The Rio Open presented by Claro champion reached the Round of 16 without dropping a set, before coming from two sets down, for the first time in his career, to beat Kevin Anderson and reach the last eight. “I am in the quarter-finals and the biggest test now is the next round [against Schwartzman]… You go on court. You can win, you can lose. That’s the only thing that you need to be ready for,” said Nadal, after defeating Germany’s Maximilian Marterer in straight sets on Monday. Nadal has now won 37 consecutive sets at Roland Garros, just four short of Bjorn Borg’s record 41 consecutive sets from 1979-1981. The Spaniard won each set he played en route to his 10th Roland Garros title last year. Juan Martin del Potro and Marin Cilic may be meeting for the 13th time on Wednesday, but the two former US Open champions’ tour-level meetings have been few and far between in recent years. Del Potro and Cilic have met just twice since the 2013 Rolex Paris Masters, and will meet for the first time on clay since their third-round meeting in Paris six years ago. The Argentine is aiming to reach his second Roland Garros semi-final, nine years after he lost in five-sets to eventual champion Roger Federer at the last four stage. On the other hand, Cilic, who is yet to beat Del Potro on clay (0-3), is bidding to become the fourth Croatian man in the Open Era to reach the semi-finals in Paris. Novak Djokovic is out of the French Open after Italy’s Marco Cecchinato beat him to reach the semi-finals in a huge shock in Paris. Djokovic, 31, saved three match points and missed three set points before the world number 72 finally won 6-3 7-6 (7-4) 1-6 7-6 (13-11). Cecchinato, 25, had never won a main-draw match at a Grand Slam before this year’s Roland Garros. He will face Austria’s Dominic Thiem in the last four. Their meeting on Friday means there is guaranteed to be at least one first-time Slam finalist. Seventh seed Thiem reached his third Roland Garros semi-final with a straight-set win against Germany’s second seed Alexander Zverev, who also struggled with injury. Cecchinato, who was banned for match-fixing in 2016 before having the suspension overturned, is the first Italian man to reach a Grand Slam semi-final since 1978. He is also the lowest-ranked player to reach this stage at Roland Garros since world number 100 Andrei Medvedev in 1999. Cecchinato knocked out eighth seed David Goffin and 10th seed Pablo Carreno Busta in previous rounds, and said the achievement had “changed his life”. “Maybe I’m sleeping. It’s amazing, it’s unbelievable for me. 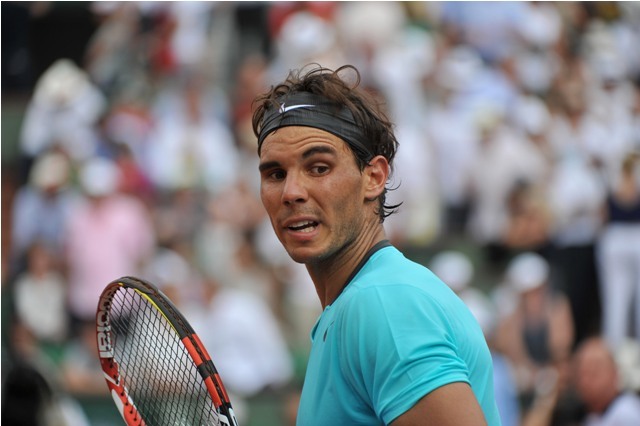 I’m very happy because it’s unbelievable to beat Novak Djokovic in a quarter-final at Roland Garros,” he added. Djokovic had been building momentum at Roland Garros over the past 10 days, dropping just one set on his way to a joint record 12th quarter-final – even though he had not been considered among the pre-tournament favourites. An elbow injury has limited his playing time over the past year, seeing him drop down the world rankings to 22nd and he received a lowly seeding in Paris as a result. Still, few saw this defeat coming against a outsider who the Serb had regularly practised with at home in Monte Carlo. In their first tour-level meeting, Djokovic was the overwhelming favourite to reach his first Grand Slam semi-final since the 2016 US Open. But he paid the price for a slow start in which he hit only three winners in the first set and failed to make a dent on Cecchinato’s serve. Eventually he began to improve as a compelling quarter-final turned into the best match of the tournament so far. Ultimately, Djokovic missed opportunities at key moments – particularly in that deciding tie-break – and leaves some wondering if the former world number one will ever return to the heights of his previous dominance. “Marco played amazing and credit to him. Congratulations for a great performance,” Djokovic said. “I struggled from the beginning. Unfortunately, it took me time to get going, and I struggled with a little injury at the beginning. Before his run at Roland Garros, Cecchinato was a player who many tennis fans had only previously heard of because of an 18-month ban he received in 2016 for match-fixing. It was later reduced to 12 months and then completely overturned – allowing him to continue playing on the ATP Tour. He has refused to talk about the issue at Roland Garros, instead preferring to concentrate on the tennis – which, at times, was stunning against Djokovic. The Italian showed flashes of shot-making brilliance and plenty of dogged defence to take a two sets to love lead – after saving three set points before winning the second-set tie-break. But, as Djokovic grew into the match, Cecchinato started to lose rhythm and focus – receiving a penalty point at the start of the fourth set for going off court without permission. Djokovic won 11 of 14 games from the start of the third set before Cecchinato somehow regained his composure to break back in the fourth set and take it into a tie-break. 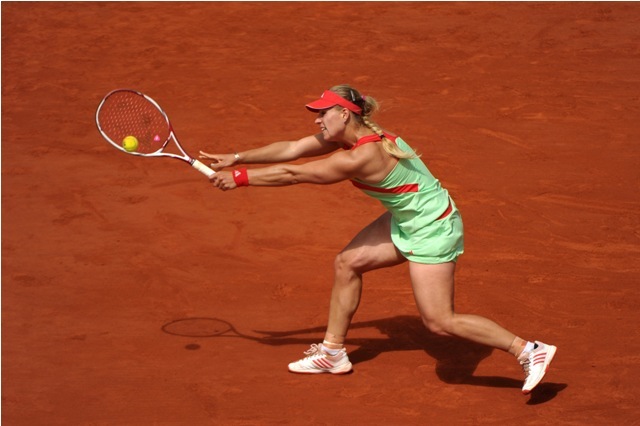 It was a breaker which had everything: missed match points, missed set points, and the stunning fluctuations left the Court Suzanne Lenglen crowd gasping in excitement. The ebb and flow meant the outcome was impossible to predict, Cecchinato eventually sealing the biggest win of his life with a backhand return winner that left Djokovic standing. He fell to the clay in exhilaration, spreading both arms across the red dirt in celebration.